Large group accommodations. Property also available for booking by smaller groups. 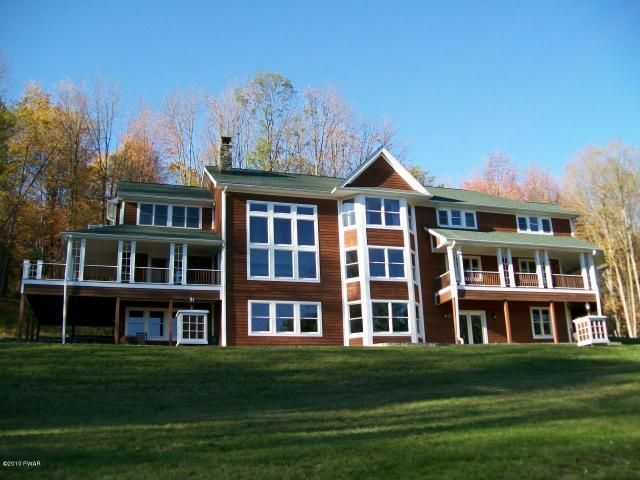 7 Bedrooms,5 Bathrooms,Sleeps 16, Private 7 acres w/dock for fishing and boating, fire pit, central air, grill, views, linens provided. Escape to this waterfront paradise on pristine Lake Wallenpaupack and surrounding mountains. Enjoy seven acres of beauty and privacy in this contemporary style home. Located in the lovely town of Ledgedale, this 5,500 sq ft 7 bedroom 5 bath property is for those looking for the very best accommodations in the Poconos. This superbly detailed residence offers a living room, formal dining room, Great Room with a floor to ceiling stone fireplace and large den. The expansive gourmet kitchen is flanked by a pantry and large eat-in area. The Grand Master Suite has a luxurious bath, jacuzzi, large walk in closet, office and lookout porch. It joins 6 additional bedrooms including a main floor master bedroom which opens to a covered porch with great views facing the lake and overlooking a wooded sanctuary. Lake Wallenpaupack is a 5,700 acre, 13 mile long power boat lake and is a major outdoor recreation destination known as the 'Crown Jewel' of the Pocono Mountains. Location Location Location: Private boat dock, easily accessible with direct lake access. Home is close to restaurants, water parks, casinos, outlet shopping, antiquing, movie theaters and more. Home is conveniently located to I-84 and marina supply and rentals. Guests enjoy Great Room, Living Room, Dining Room, Kitchen, two covered porches, grill, fire pit, patio, grounds, woods, privacy, plenty of parking for cars and boat trailers. Enjoy lakefront views and private dock. All beds made and prepared with sheets and bedding. Brand new staineless steel appliances, gas stove/oven, fully equipped kitchen. The Lake Ariel home gave our 16 family members a wonderful opportunity to be together in a comfortable setting and enjoy the beautiful setting even in late March. There was plenty to do. The only complaints were that the great room shown with a fire place in the listing did not have a fire place that was in working order. Also, the wifi system was very weak but we did not let it bother us. No hesitation is saying we would consider going back to the property in the future. The landlord, Mary was most helpful. The house was amazing and everything was available! Mary was also very easy to communicate with before and during our stay. My extended family of 15 had a wonderful time, celebrating the holidays together. Mary’s beautiful home accomodated all of us nicely and it had everything we needed. The view was stunning and the location convenient, as we were traveling from Long Island, the Albany area, and Virginia. Thank you for sharing your home with us!. We had a wonderful stay in your house. The house was very spacious and comfortable. We had a great stay. The house is exactly as pictured in the listing. Great for large groups - plenty of privacy but great common areas. Beautiful view, lots of space to hang out indoors and out. Spacious beautiful home, great location! Mary's home is absolutely STUNNING! She welcomed us in and set us up with everything we would need for the couple days we stayed. She even set us up with some kayaks for the day! There was a small group of us, so we had plenty of space, however I see how even with a big group the place would still be warm and cozy. Will definitely be back! Lake Wallenpaupack Enjoy recreation, lakes, boating, fishing, water sports, nature, hiking, biking art, music, festivals, restaurants, antiquing, water parks, casinos, golfing, outlet shopping, movie theatres and more. WE ACCEPT RENTALS FOR 2-7 NIGHTS. FLEXIBLE BOOKING DATES. PLEASE NOTE THAT NIGHTLY RATE CALCULATIONS DO NOT APPLY TO RENTALS OF LESS THAN 7 NIGHTS. LANDLORD WILL BE ON THE PREMISES AND WILL BE AVAILABLE TO ANSWER QUESTIONS AND ASSIST. THE MAIN FLOOR AND AND SECOND FLOOR ARE INCLUDED IN THE RENTAL (5,500 SF). THE LOWER LEVEL IS RESERVED SPACE FOR LANDLORD.